Kežmarská dolina (Valley of Kežmarok, from the name of the nearest city), is actually only the nickname of "Dolina Bielej Vody Kežmarskej" (Valley of the white waters of Kežmarok). 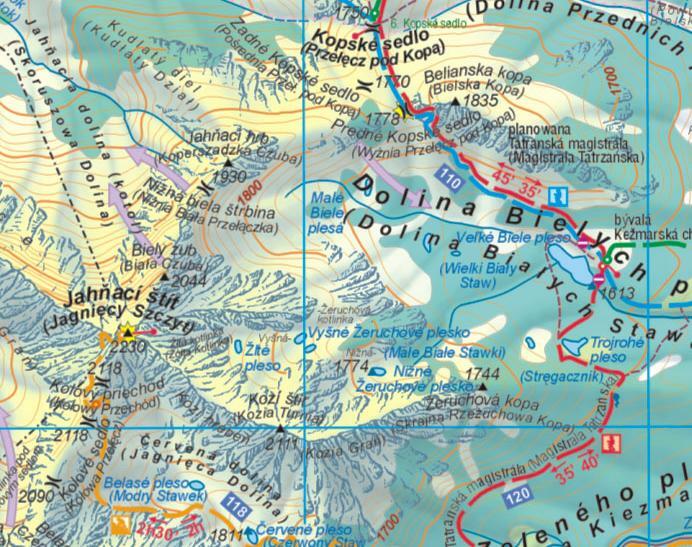 This is one of the most entertaining valleys to cycle in the High Tatras, with a good condition required, but not technically as hard as Dolina-suchej-wody. 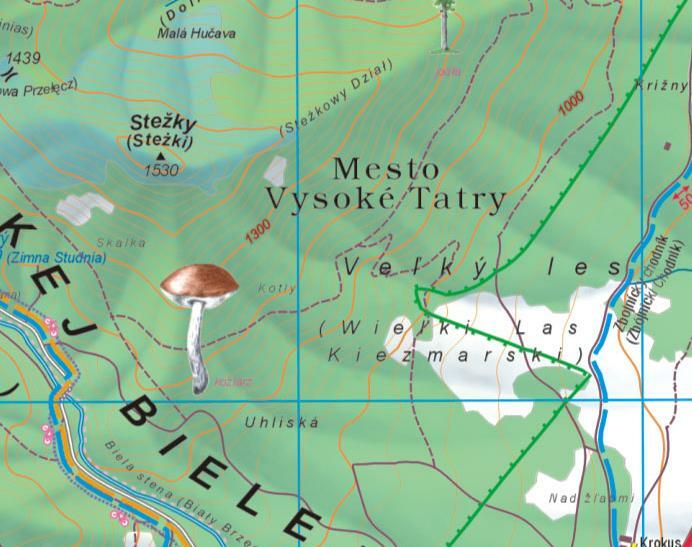 In the upper end the this valley is located one of the most beautiful lakes of the High Tatras, Zelene Pleso ("Green lake"), as well as one of the finest mountain huts, located on the shore of it, at 1500m of height. There are many possibilities to continue ahead on foot via a handful of pedestrian marked trails, while leaving the bike temporarily in the storage local of the hut. Once again, a very fine way to shorten a long approach to hike a high peak of the High Tatras in less than a day. At the car park "Biela Voda", 200m further south of Kežmarské žľaby on the main road, take the yellow-marked trail that goes through a forest. First, it crosses some 500 through the ravaged forest of the foothills (due to the 2004 storm), but soon it enters the upper non-damaged part of the forest. The track is land-rover-like track (the mountain hut is supplied by land rovers which use this way), made of hard clay, small chippings, occasionally small stones, but generally a quite decent surface to cycle on. After some 2 km the track switches to the right side of the stream via a little wooden bridge, and then reaches a junction with a blue marked trail (and a green one some meters further). Always keep the yellow marks which are the only trail allowed for bicylces, even if the other trails look tempting. This is a popular area so you are likely to be fined if you get caught outside of the cycling trail. 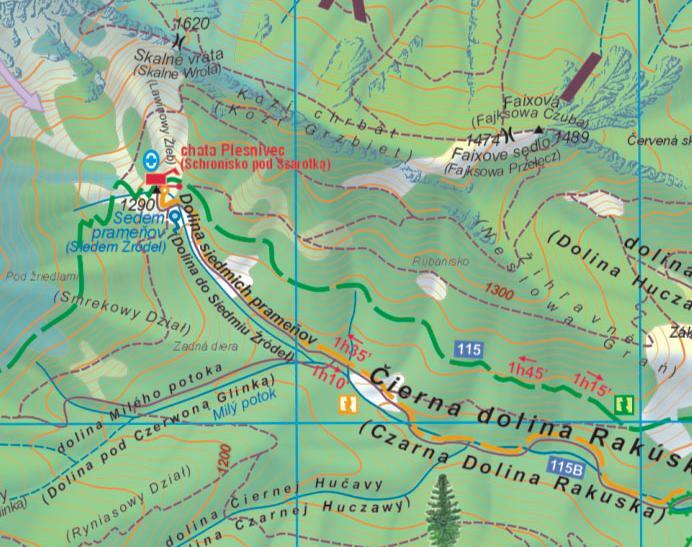 The yellow marks get back to the left shore of the stream "Biela Voda", and the steepest part is located around here, where the track climbs steeply the time of few bends. 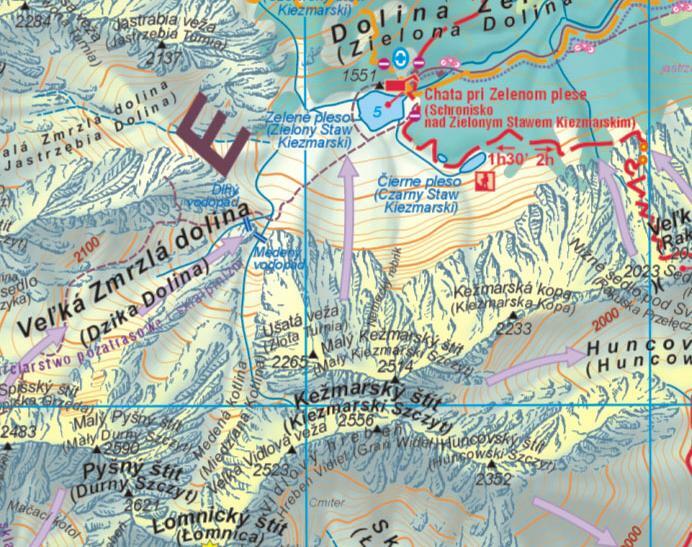 The reward is that during this lap of time the high tops of the High Tatras become slowly more and more visible. After a straight line, the track changes suddenly its orientation and goes west. We reach the upper level of the forest and enter the landscape of the high mountain, made of pastures and dwarf pines, and we are surrounded by gorgeous granitic peaks, amongsts the tallest of the Tatras. This is the most beautiful part of the trail. 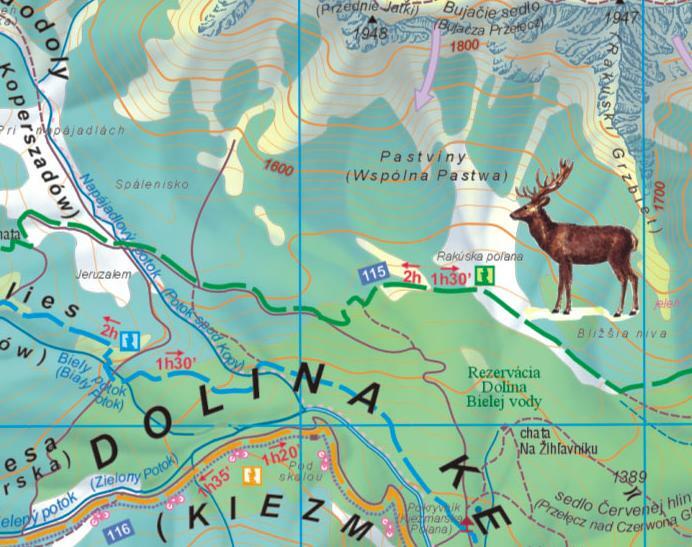 Soon we reach Chata Pri Zelenom Pleso ("hut near the green lake"), a beautiful mountain-refuge in front of the lake. It can accomodate officially 56 people. Non officially much more, in summer some tents are set up behind the building so more people can be accomodated. But you can just have a dinner or a beer at the terrace of the hut facing the lake. If the weather is too cold you can go inside and choose a table near the window with the same view to the lake, watching hikers and mountaineers going and arriving. This is really what we can call a "View" with a big "V". If you feel doing few of these hikes around, you can arrange with the owners to leave the bike safe somewhere (bring a locker just in case). There are many places where you can walk around. Sedlo, towards the White Tatras. If you don't feel doing any of these things you can just have a walk around the lake. This is not a marked trail but usually walking around the lake is tolerated. From the North (city of Cracow, airport), the best is to reach first Nowy Targ, then the direction of Jurgow, then pass the border, Podspady, and Kežmarské žľaby, near where, some 200m south, is the car park of the beginning of this trail. 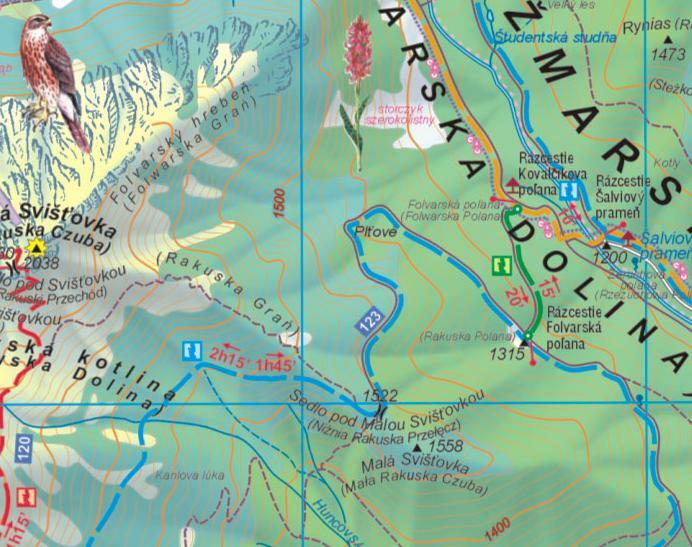 From the South (Poprad and Kosice are served with an airport too), reach Poprad and then Tatranské Matliare to arrive to Kežmarské žľaby. The car park is not free, it costs the surprisingly high amount of 160 SK (5€ !) so, if you cycle, better park a bit further from this place, for example in front of some building in Kežmarské žľaby. Make sure the snow has completely disappeared in the valley in late spring. In the summer, you will find tourists on the trail, especially on the way down, some of them with children, sometimes in the middle of the way. Be very careful.